log x = characteristic of x + mantissa of x. Remember that the base is 10 and we are considering natural logarithms or logs only. If x > 1, then count the digits on the left of the decimal point; if the number of digits is y, then the characteristic is (y – 1). also written as ( z + 1 ), read as (z + 1 ) bar. As mentioned earlier, the mantissa has to be read from a standard log table. Log tables consist of rows that go from 10,11, up to 99. The columns have values 0,1, 2, up to 9. Beyond the 10 columns, there is another column which is known as the mean difference. For determining the mantissa, a particular row has to be read off and the mean difference has to be added from the table. Mantissa is a non negative real number , which is less then 1. While determining the mantissa, the decimal point of the number has to be ignored. Most of the log tables give values of mantissa up to four digits only. For more than a four digit mantissa, we have to round off the last digit. Number with same sequence of digits have same mantissa. Example 1 : Find the log of 500.2. For mantissa, read from the table a number 5002. From the rows, choose 50, and read off from the number under the column 0. The number given in the log tables is 6990. Now read, in the same row, the mean difference under 2. This number is given as 2. Mantissa = 6990 + 2 = 6992. Example 2 : Find the log of 72.98. For mantissa, read from the table a number 7298. From the rows, choose 72, and read off from the number under the column 9. The number given in the log tables is 8627. Now read, in the same row, the mean difference under 8. This number is given as 5. Mantissa = 8627 + 5 = 8632. Example 3: Find the log of 0.0009887. For mantissa, read from the table a number 9887. From the rows, choose 98, and read off from the number under the column 8. The number given in the log tables is 9948. Now read, in the same row, the mean difference under 7. This number is given as 3. Mantissa = 9948 + 3 = 9951. Example 4 : Find the log of 0.1234. For mantissa, read from the table a number 1234. From the rows, choose 12, and read off from the number under the column 3. The number given in the log tables is 0899. Now read, in the same row, the mean difference under 4. This number is given as 14. Mantissa = 0899 + 14 = 0913. The log of 1.234 will be 0.0913. The log of 12.34 will be 1.0913. The log of 123.4 will be 2.0913. The log of 1234 will be 3.0913. To keep consistency, the log of 0.1234 is written as .0913, (although its value is – 0.9087). The log of 12344 will be as follows : this is a five digit number, so the last that is the fifth digit will have to be rounded off. The fifth digit is 4, which is less than 5. So take the last digit is 0. Thus the mantissa of 12344 will be same as the mantissa for 1234. The log of 12346 will be as follows : the last digit 6 is rounded off as 1 and is added to the second last number 4. Thus the last digit becomes 4 + 1 = 5. So we have to find the mantissa for 1235, which is 0899 + 15 = 08914. Antilogarithm is the exact opposite of logarithm of a number. If x = log b, then antilog (x) = b = . Remember that antiloga (x) = . Antilog table for base 10 is readily available. Antilog tables are used for determining the inverse value of the mantissa. From the characteristic, the position of the decimal point can be determined. Antilog tables consist of rows that go from .00, . 01, up to .99. The columns have values 0,1, 2, up to 9. Beyond the 10 columns, there is another column which is known as the mean difference. 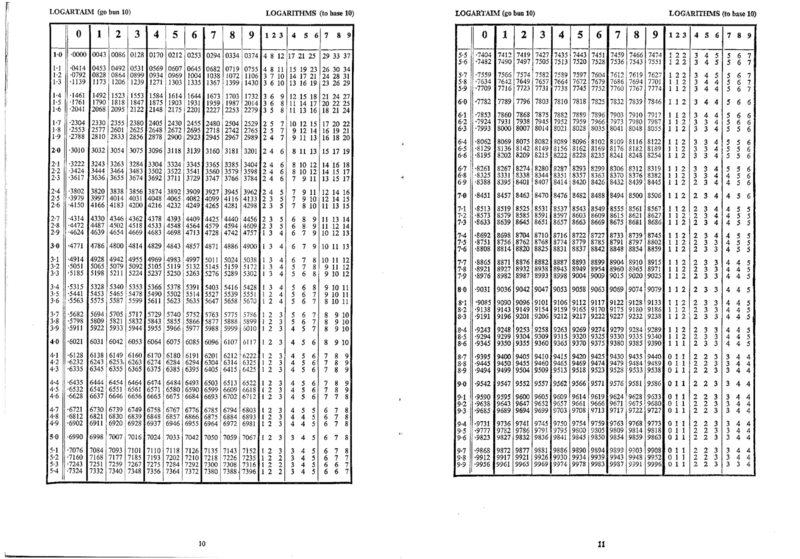 For determining the antilog of the numbers after the decimal point, a particular row has to be read off and the mean difference has to be added from the table. Example 1 : Find the antilog of 2.6992. The number before the decimal point is 2, so the decimal point will be after the first 3 digits. 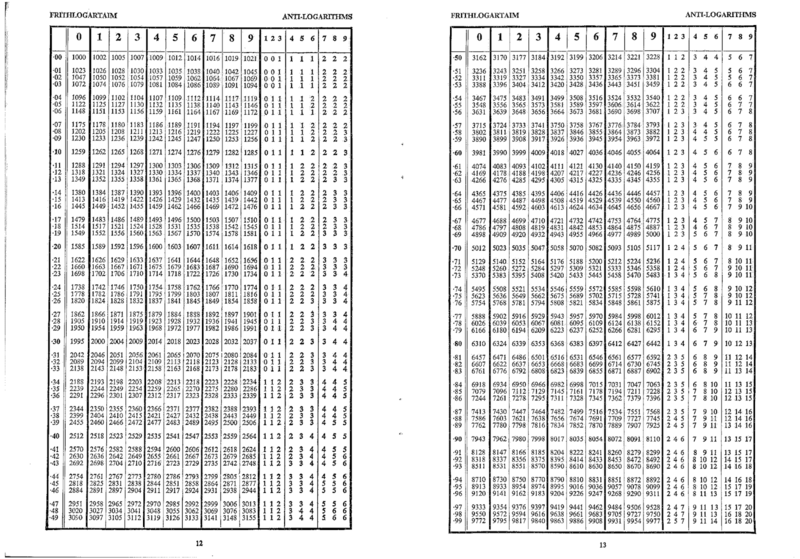 From the antilog table, read off the row for .69 and column of 9; the number given in the table is 5000. The mean difference in the same row and under the column 2 is 2. To get the inverse of mantissa add 5000 + 2 = 5002. The number before the decimal point is 0, the number of zeroes after the decimal point is one. 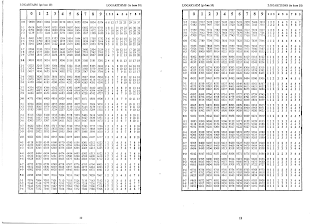 From the antilog table, read off the row for .09 and column of 1; the number given in the table is 1233. The mean difference in the same row and under the column 3 is 1. To get the inverse of mantissa add 1233 + 1 = 1234. Now place a decimal point before the 1234 followed by a zero and you get the number 0.01234. ApplicationsWe will now see how logarithms and antilogarithms of numbers are useful for calculations which are complicated or have very large/small numbers. Example 1 : Find 80.92 * 19.45. Use the log function on both the sides. Now use antilog functions on both the sides. 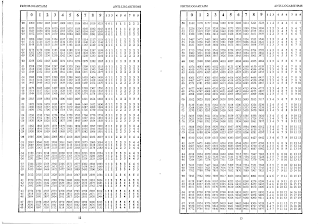 From the antilog tables we see that the antilog of 3.1969 is 1573.0.